UPDATE: Today the official cover for the companion was revealed by Scholastic! 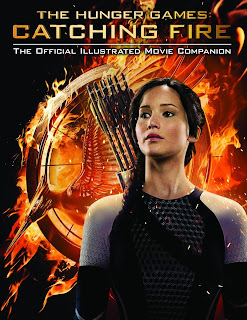 The official movie companion book for Catching Fire is now available to pre-order, and will be released the same day as the movie, on November 22nd 2013. According to Amazon there will be a fantastic 160 pages! If the previous movie companion for The Hunger Games is anything to go by, you can bet we'll be getting some awesome behind the scenes pictures and stories. "Catching Fire, the New York Times bestseller by Suzanne Collins, is now a major motion picture — and this is your guide to all of the movie’s excitement, both in front of the camera and behind it. Go behind the scenes of the making of Catching Fire with exclusive materials, including back-stage photos and interviews. From the screenwriting process to the casting decisions, from the fantastic new sets and gorgeous costumes to the actors’ performances and the director’s vision, this is the definitive companion to the second Hunger Games film."